Research into CAM has increased over the last few decades. This is due to a significant change in how health professionals and patients perceive and use complementary therapies in human and veterinary medicine. Research is carried out in order to strengthen the scientific base of the individual CAM modalities, improve CAM practice, establish efficacy and verify its clinical effectiveness. An important aim is making its practice more effective and reliable in a wider range of conditions. 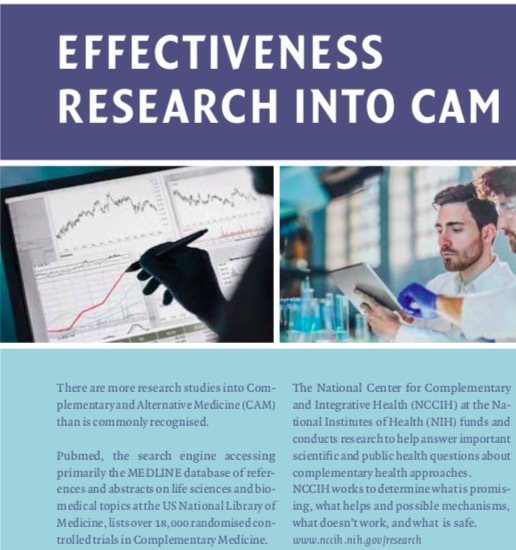 Basic, clinical, and health services research in CAM are all essential to facilitate the inclusion and integration of CAM in health care systems. Collecting clinical evidence for the effectiveness in various clinical conditions and investigating efficacy and modes of action also leads to more scientific credibility. Cost-effectiveness studies are important to evaluate the impact of CAM treatment on health systems and health insurance costs. More research into CAM currently exists than is commonly recognised. PubMed, the search engine accessing primarily the MEDLINE database of references and abstracts on life sciences and biomedical topics at the US National Library of Medicine, lists over 18,000 randomised controlled trials in Complementary Medicine. The Cochrane Collaboration, an international effort to develop an evidence base for a wide variety of medical therapies, both biomedical (conventional) and CAM, lists more than 7,000 randomised trials for various CAM therapies in its electronic library. Furthermore, a number of Cochrane Collaboration systematic reviews of this worldwide research literature have identified the potential benefits of CAM and related approaches and products for a number of chronic conditions. The National Center for Complementary and Integrative Health (NCCIH) at the National Institutes of Health (NIH) funds and conducts research to help answer important scientific and public health questions about complementary health approaches. NCCIH works to determine what is promising, what helps and possible mechanisms, what doesn’t work, and what is safe. CAM-Cancer is an open-access, non-profit web resource providing health professionals with evidence-based information about CAM for cancer.